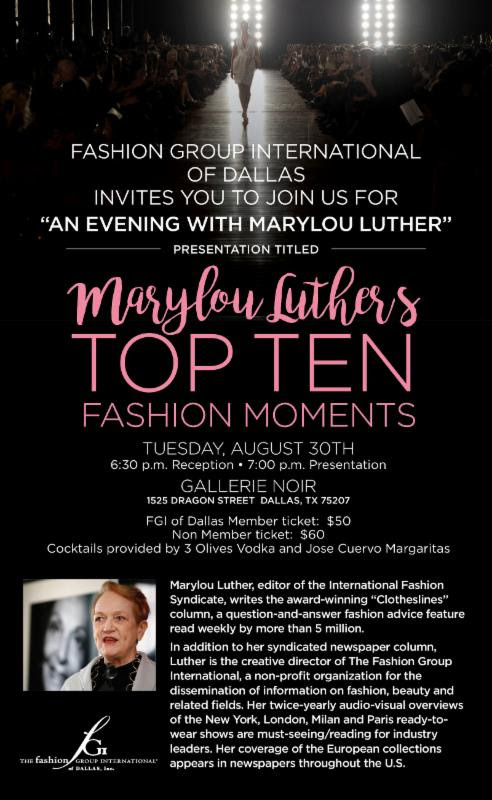 This Tuesday, August 30, FGI Dallas will be welcoming Marylou Luther to discuss her Top 10 Fashion Moments. She is the editor of the International Fashion Syndicate and writes the award-winning fashion column, Clotheslines. Ms. Luther is a celebrated fashion industry icon and we are so excited that she is coming to spend an evening with FGI Dallas! Don't miss out on this fabulous opportunity, get your tickets on Eventbrite. See you there!